Had it up to here with Facebook? You can always delete your account, but it’ll require a little work—and patience—on your part. First, we need to make a clear distinction between merely “deactivating” your account and actually deleting it. 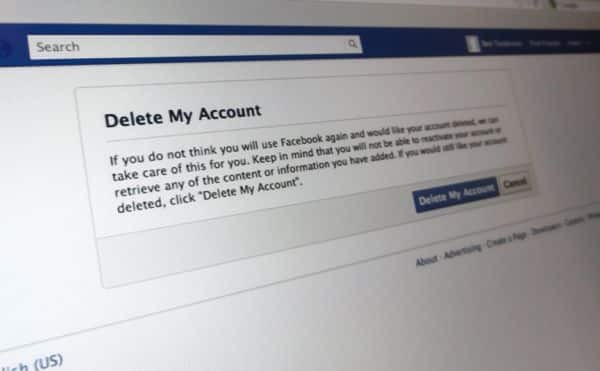 Deactivating your Facebook account is a fairly quick and easy process, but it will only hide your profile and personal information, not wipe it completely off of Facebook’s servers. To deactivate your account, visit the Security Settings menu (click the down-arrow in the top-right corner of the screen, select Account Settings, then click Security in the left column), click the “Deactivate your account” link, and follow the prompts. Change your mind? Just log back into Facebook, and your profile will be waiting for you. But what if you want to delete your account completely—and permanently? You can, but you’ll have to jump through a few more hoops, and the process isn’t instantaneous. The first step is actually finding the link for deleting your account. One way is to search for “delete account” in the Facebook Help Center, or you can just click this link. Next, you’ll come to a page warning what will happen if you delete your account—namely, that once your account is deleted, you won’t be able to recover your information. Ready to continue? Click the “Delete My Account” button. A pop-up window will appear with yet another warning: “You are about to permanently delete your account. Are you sure?” You’ll then have to enter your Facebook password, then enter a “captcha” security code (a cluster of random text, intended to make sure you’re not a malicious spambot). All done? Click the “Okay” button, then check your inbox for an email confirming that you’ve requested that Facebook permanently delete your account. You’ll have two weeks to change your mind after asking Facebook to delete your account. Now comes the time-consuming part. Facebook won’t delete your account right away—indeed, you’ll have to wait a full 14 days for your Facebook profile to be erased forever. If you have second thoughts during your two-week wait, you can log back into your account and click the “Cancel Deletion” button. One more thing: Even after Facebook has officially deleted your account, keep in mind that some of your information may remain on Facebook’s backup servers for up to 90 days. After that, though, your profile and other personal data should be completely wiped off Facebook. Want to download all your personal data from Facebook before deleting your account? You can—and should, actually. Here’s how. Looking for more Facebook tips? Click here!